From the TT login dialog you can manage which markets and gateways (i.e. flavors or brokers) will be available for use within X_TRADER. 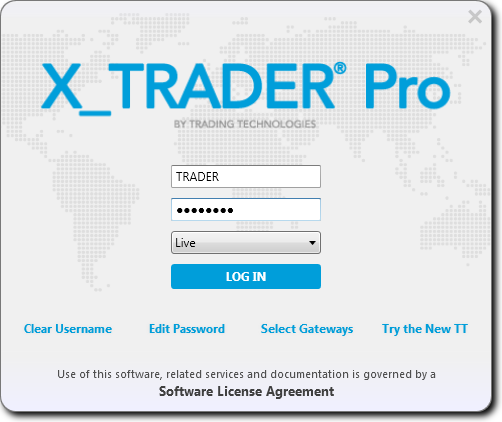 When logging into X_TRADER you will be informed if any of the selected gateways are currently inactive. Note: You can also manage your login gateways after logging in to X_TRADER, see Modifying Login Gateways for more information. From the TT Login dialog click Select Gateways after entering your Username and Password. A yellow box indicates that some gateways are inactive within a market. A circle indicates that a market has some, but not all, of the associated gateways enabled. Note Once you have enabled all gateways for a market it will become locked once you login to X_TRADER. Locked markets and gateways display a lock icon to the right of the name.